Did you end up in a food coma like me on Thanksgiving? The holiday season is upon us when opportunities to overindulge seem frequent and plentiful – from parties with endless treats to munch on to family dinner gatherings with feasts that offer seconds, thirds and more of our favorite dishes. Despite the immediate satisfaction, overeating can lead to hours of discomfort and lethargy. Here are three easy tips to practice in an effort to stop a food coma before it strikes. 3. HERBAL TEA: When you return home with a full belly, treat yourself to a cup of of herbal tea or better yet, make a cup of warm water with lemon and honey to help ease bloating and stimulate the digestive system. After you finish your warm drink, do a few yoga poses to improve digestion, and you’ll be in even better shape! In addition to keeping these three hydrating tips in mind while you mingle, you should also be sure to stay clear of too many sweets (easier said than done). Large quantities of any food can cause a food coma, however, sugar, or sucrose, found in desserts tends to be the main culprit. When we consume sugar, our bodies produce extra insulin to help absorb the spike of glucose. In turn, the extra insulin causes our brains to produce more serotonin and melatonin, two neurochemicals that can make us feel drowsy and lethargic. Yesterday was the annual Great ShakeOut Day, a unified worldwide effort to practice how to be safer during earthquakes. From California to Japan, (and in hundreds of cities, states and countries in between), millions of people practiced the Drop, Cover and Hold drill, at 10:20 am on October 20th. The ShakeOut, which began in California in 2008, is not only an opportunity for communities, schools and other organizations to practice safety drills, it’s also a time to review and update emergency preparedness plans and supplies. And, since emergency preparedness goes well beyond just being ready for the next big earthquake, I couldn’t pass up this opportunity to write about what is likely the most important part of everyone’s emergency kit: WATER. The body can go without food for upwards of 30 days but will last less than one week without water. So if you’re going to do just one thing to prepare for an emergency, store water! A supply of one gallon per person per day for 3-days, is the minimum that you should keep on-hand. At least a 7-day supply is optimal. So, if you have four people in your household, you should have at least 12 gallons of water stored at all times. If you’ve read some of my other posts, like What’s On Tap? It’s Hetch Hetchy For Me! and I’m a “Personal” Water Bottle Addict – Here Are My 5 Faves, then you know that I’m not an advocate of buying bottled water. However, in this case, I urge you to give yourself peace of mind by buying, at least a 3-day supply, of bottled water for your family today! Mark the date on the water bottles, find a place to store them, and make a note on your calendar to replace them after one-year. After adding bleach, shake or stir the water container and let it stand for 30 minutes before drinking. Visit the Federal Emergency Management Agency (FEMA) website for additional guidance on preparing and storing an emergency water supply. I also recommend printing and keeping handy this Emergency Disinfection of Drinking Water fact sheet. Organizing an emergency supply kit for my family is something that I’m always putting off. It seems to continually be on my “to-do list”, but never quite makes it to the top or gets priority. There’s always something else that seems more “urgent” or worthy of my time. However, I do always keep water on hand in my garage; this is something that is easy to do and, in my opinion, the minimum that anyone should do…..especially since I live in California. In researching for this post I printed the checklists and fact sheets that are linked, as the start to finally getting a full emergency kit and plan together. Alongside our regular kid-centric activities for this weekend, which include a birthday party, gardening at my daughter’s elementary school, and gymnastics class, I blocked several hours to make a full emergency kit. Now that my kids are old enough to help, I figure making the kit together can be both an educational and fun activity to do with them. Hopefully moving this item from the status of a “to-do” on a never ending list, to a “scheduled activity with kids” will finally make it happen! Last week I wrote a post about the best times of day to hydrate, and I’m sure it came as no surprise that key times to hydrate include before, during and after exercise. While it’s obvious that exercise requires increased hydration, many people are unaware of just how much water intake directly impacts performance. Improper hydration can result in muscle cramping, decreased strength and reduced endurance, impeding energy and performance. Sweat is one of the obvious things that happens during a workout; it’s the way our bodies cool down when they start to heat up. It follows that the more a person sweats, the more water they should drink to replenish. Sweat rates vary by individual and are further influenced by factors including exercise intensity, exercise duration, the climate (including temperature and humidity), and the body’s pre-exercise hydration state. It’s straightforward to check your individual sweat rate by weighing yourself directly before and after exercise and accounting for exactly how much water you consumed during the workout……you’ll also have to either hold your pee or take your pee-volume into account. You can google “calculating perspiration rate” for more details on how to compute your rate or use a handy sweat rate calculator like this one that I found on the Gatorade Sports Science Institute’s website. Another quick metric of proper hydration is to note how often you’re urinating. Ideal hydration leads to urination every 1 – 2 hours, even during exercise. Depending on your gender, age, size and perspiration rate, you lose about four cups (approximately one liter) of water per hour of exercise. If you’re working out in a hot climate, you can easily lose up to two litres of water per hour during a cardio session. Adequate water intake before, during and after exercise does more than replenish water lost from perspiration, it also plays a key function in maintaining blood volume and electrolyte balance. Electrolytes such as sodium, magnesium and potassium, are lost from the body with sweat. However, except in extreme cases, losses are small and replacement during exercise is not a priority. ‘Sports drinks’ often contain electrolytes, particularly sodium. These have the effect of stimulating water absorption from the small intestine, which is beneficial during exercise. In addition, after exercise, replacing lost sodium is essential for full recovery and rehydration. Extreme athletes will require fluids from a variety of sources, not just water. However, if you’re not an extreme athlete who requires a sports drink, consider something, without the sugar and calories, that will provide a mild electrolyte boost, such as Glaceau’s smartwater or H2wOw’s all natural water enhancer, with extracts of real fruits and mineral electrolytes. I had planned to use infogr.am to make a cool graphic that listed how much water the average person needs before, during and after a workout but during my research I found something better than anything I would be able to make! The graphic below is from a post on greatist.com and includes recommendations on how much water to drink while exercising as well as a lot of other great information. If you’re reading this post, then you already know that drinking enough water is an important component to maintaining a healthy lifestyle. 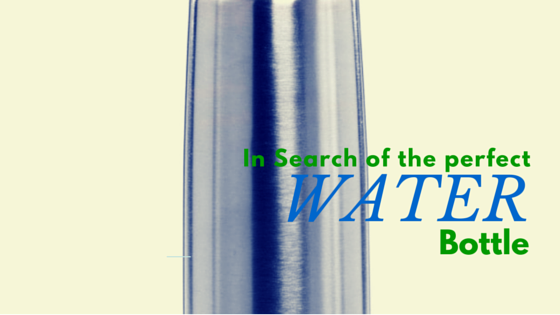 BUT, it may surprise you to learn that when you drink water is almost equally important. This is especially true for those of us who aren’t disciplined enough to consistently drink water at regular intervals throughout the day. So, if you’re like me and not always or on top of your water intake, here are some simple guidelines to follow to help ensure that you hydrate at the most important times. Make this the first thing you do after getting up……before a cup of coffee. Try adding lemon for even more benefit. One or two glasses of water first thing in the morning activates internal organs and remove any toxins before your first meal of the day. You’ll feel more awake and refreshed too! One glass of water 30 minutes before a meal helps regulate digestion, curb your appetite and moisturize the stomach lining to better handle brittle and acidic foods. One glass of water an hour after the meal HELPS the body to absorb the nutrients you just ate, drinking water too soon after a meal will dilute the body’s digestive juices. If you’re hungry between meals, drink a glass of water first to see if you’re dehydrated. Sometimes people think they’re hungry when they’re really just thirsty. Hydrating before a workout will keep your body from drying out and feeling thirsty. Drink at least 12 ounces before a workout. Depending on the temperature, humidity and your body’s weight and fluid levels, you’ll need one to several servings of water to protect against dehydration during and after workouts. Following vigorous exercise, be mindful to drink enough water to replace fluids lost through perspiration. Showering or bathing is relaxing and helps lower blood pressure. Drinking water before will help to further thin your blood and dilate blood vessels. A glass of water before going to bed has many health benefits, including helping to avoid the thickening of the blood which can cause stroke or heart attack. Hydrating before bed also helps balance hormones, replenishes any fluid loss that can occur during the night, and reduces nighttime leg cramping. A glass of water when you feel tired will help the brain to regain focus and the body feel energized. If you’ve gotten a good night’s sleep but still feel tired, you may be dehydrated; fatigue can be a sign of dehydration. If you find yourself around someone who may be ill, drink more water than usual to help wash away germs and viruses that your body may have picked up. A well-hydrated body encourages bacterial and viral invaders to move along so they don’t settle and multiply in your system. The same holds true for when you’re sick, you need to drink plenty of fluids, including water, to get better. 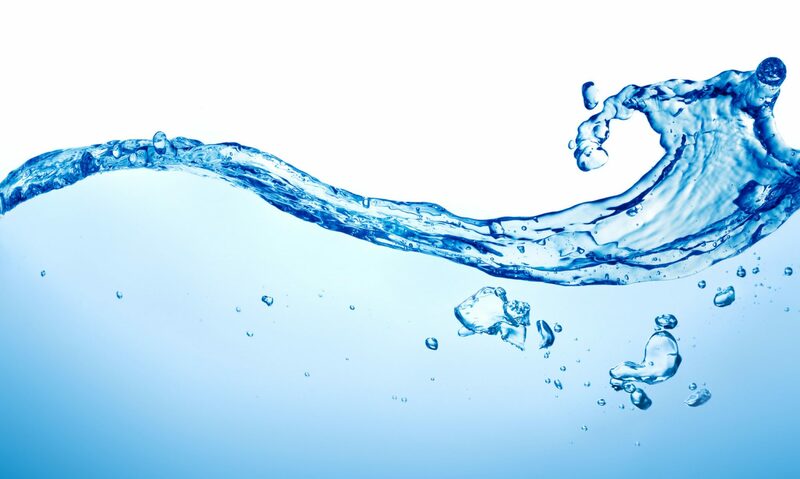 Water helps your kidneys flush out medicines so they go down smoothly. Do ensure you never take medicines with liquids other than water. Only water is safe with medicines as it doesn’t contain anything that can negatively affect how medicines are absorbed. The other day I went for a massage. It was MUCH needed after 6 weeks of traveling with my kids and lots of lifting, sitting and flying. My body was full of aches and pains. The therapist I saw was an interesting guy from China who, upon noticing that my hands and feet felt cold, and my neck and shoulders very tense, had some recommendations for me. He suggested a warm morning drink made with water, dried longan fruit, red date and ginger, explaining that it’s a common drink for Chinese women to improve circulation and help with relaxation. I’m game to trying anything that is natural and helps with relaxation! Since I was already in the Inner Richmond district of San Francisco, home to a large Chinese community and many great Asian markets, I decided to pick up the ingredients straight away and give the concoction a try. At the market, I discovered that dried longan fruit is also known as Long Yan Rou and is closely related to the lychee. And, Red Dates are actually just another name for jujubes. This new drink was sounding better and better! Adding ginger to my water is something I already enjoy (more on that in a future post) but the other two ingredients were new to me and I really had no idea how to prep them for water. Both the dried fruits are the consistency of Medjool dates….so, I assumed that some soaking was in order but was certainly open to more guidance on this. Red Dates: Commonly called jujubes, Chinese dates, Korean dates, or Indian dates are a species of Ziziphus in the buckthorn family (Rhamnaceae). The fruit and its seeds are used in Chinese and Korean traditional medicine, where they are believed to alleviate stress. In addition to this they are used for many other purposes, including anti-fungal, anti-bacterial, anti-ulcer, anti-inflammatory and their wound healing properties. Longan Fruit: One of the better-known tropical members of the soapberry family (Sapindaceae), to which the lychee also belongs. In Chinese food therapy and herbal medicine, the longan is believed to have an effect on relaxation. The longan, much like the lychee, it’s thought to give internal “heat”. Ginger: A flowering plant (Zingiber officinale) whose rhizome, ginger root or simply ginger, is widely used as a spice or a folk medicine. Ginger is one of the oldest and most versatile medicinal foods and in China it’s been used by healers for thousands of years. Traditional Chinese medicine holds that ginger “restores devastated yang” and “expels cold”. Ginger has many believed uses including reducing muscle soreness and inflammation, alleviating nausea and helping digestion. Now that I better understood the ingredients, I was ready to use them! I didn’t find much when I Googled this exact combination, but I did find many recipes with ginger and red dates, many of which included goji berries. The closest recipe I found was on a lovely blog called A Beautiful Day and I used this recipe as my reference, omitting the pear and pine nuts. After prepping, boiling, simmering for an hour, and finally straining, my drink remedy was ready! I let it cool to a lukewarm temperature and then gave it a try. It was quite interesting and, based on the profile of the ingredients, more medicinal tasting than I expected, . Right away, I could see why the recipe on A Beautiful Day called for pear because the drink had a bit of a bitter quality and needed something a little sweet to offset this. I added a tiny bit of honey and it became much more enjoyable to drink. I found it very soothing and cozy. It reminded me of Traditional Medicinals Throat Coat Tea, which for years has been a favorite product of mine and something I always have on hand. I’ve now been enjoying this medicinal water for a few days and have tried it both warm and cold (the batch I made yielded enough for at least one cup daily for a week). I definitely prefer it more as a warm tea-type beverage. And, while I don’t know if it has had any true efficacy on my health, it’s something I’m glad I tried and will make again. It was fun to experiment with new-to-me ingredients that have so many believed healing properties. At my house, we all start the day with a glass of water. 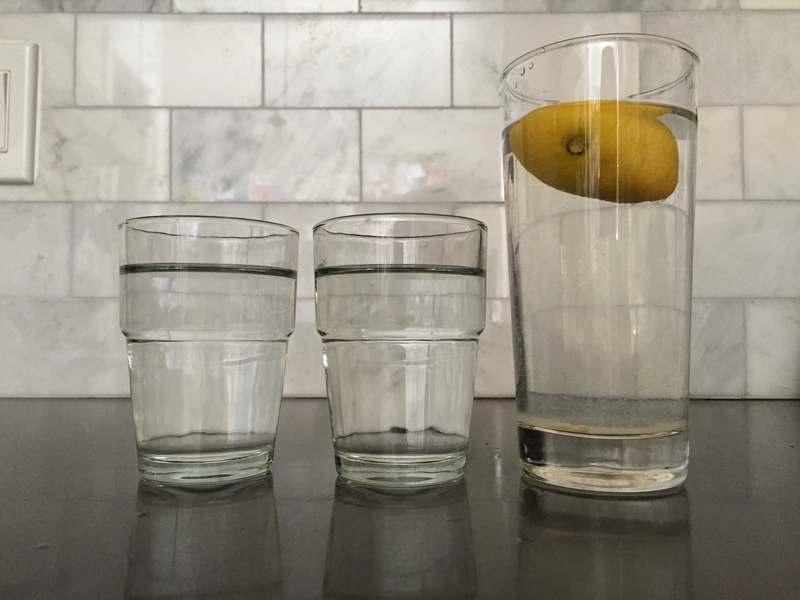 I’ve always enjoyed warm water with lemon (or sometimes lemon and honey) first thing in the morning and I make sure my girls have at least one glass of water before they leave the house because I know that they’re not always drinking enough during the day and I try to stay ahead with their hydration. I find that our little ritual of drinking our water together first thing helps us start the day off on the right foot – I am hopeful that doing something good for our bodies in the morning makes us more mindful of making healthy choices and drinking more throughout the day. I start my day with a tall glass of lemon water and my girls each chug a short glass of plain H2O. It’s a healthy way to start each day. Most people know it’s healthy to start the day with a glass of water, but not everyone knows why or remembers to do it. Hydrating in the morning can make you feel more energetic by keeping your metabolism in check, helps remove toxins from your system, improves digestion and stimulates elimination. Having a glass of water first thing and then drinking more throughout the day will help you avoid health issues that may be related to dehydration. If you don’t like to drink plain water, then try squeezing some lemon, lime or orange into your water. Not only does lemon give water a nice burst of citrus taste but it also provides many health benefits. For a really fast and convenient way to switch up the taste of your water but still keep it super healthy and natural you can also add a few drops of essential oil or try a natural water enhancer like H2wOw. I know that it may not be a common practice to begin each day with a glass of water but it really should be. It’s such a small and easy change to make and keep but it is also a habit that can make a big difference. My girls and I toast our water glasses each morning — give it a try with your kids too. Size — I don’t want it to be too big but it also can’t be too small. A bottle that can hold around 20 – 24 ounces is generally the best size for me. This is equal to 2.5 – 3 cups of water and is big enough to get me through a workout at the gym or a few hours out and about. A shape that is narrow enough to fit in car upholders is also important. Materials — While I love the designs and ease of some plastic bottles, I worry too much about the chemicals in plastic and it just isn’t for me. I only use bottles that are high quality stainless steel or glass (I like them to be labeled BPA and toxin free). I also make sure whatever other materials are included (straw, spout etc) are made out of high quality materials, like silicone. 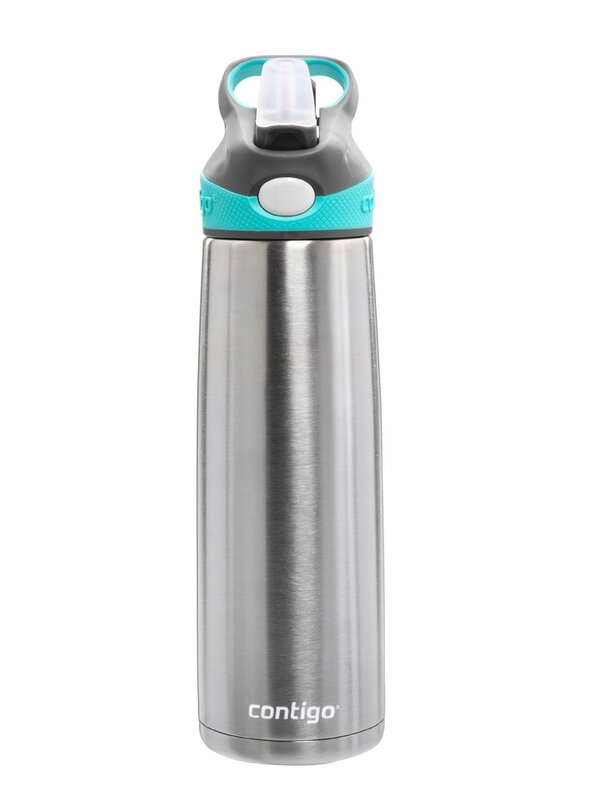 For the stainless steel bottles, I want them to be double walled and vacuum insulated with a sweat-free (no condensation) surface. Weight — I do love glass bottles but they’re just not practical to go very far with. I have a Lifefactory bottle that I often use at home but, beyond a car-only trip, I’ve stopped bringing it out of the house. Glass is much heavier and by the time it’s filled with water it’s just not something I want to lug around. That said, drinking out of glass (either a water bottle or a cup) is my favorite way to go and if it wasn’t for the weight I would always choose glass. Drinking Valve — I like drinking valves that are easily accessible but that don’t come in contact with anything when they’re closed — meaning, I don’t ever want to touch the drinking valve or spout to open or close it and I don’t want it coming in contact with other items in my bag or wherever else my water bottle travels (like the back pocket of an airplane seat — ewwww). So, ideally, I like valves or covers that pop up with the press of a button and are designed so I don’t have to touch the spout (at all) to get it closed. Leakage — I can’t believe it still happens but it does. I won’t name the bottles that are on my list of least favorites, but most of them have made the list because they leak (as in all over my purse and other places that don’t mix well with water). Leaky water bottles are the worst……weather it’s because the valves are not completely leak proof when turned sideways or because the top has threading that isn’t great quality and sometimes causes the lid to go on crooked, I have had my fair share of bad experiences with leaky water bottles, and leakage should in fact be at the top of my criteria list. Ease to Clean — I like a wide mouth top so that I can easily fit a bottle brush inside. As I mentioned in my post Keeping My Family’s Reusable Water Bottles Clean and Yucky Free, as awesome as reusable bottles are, it’s no secret that they’re also a perfect breeding ground for bacteria. I clean my bottles daily and want it to be a simple task. And, if you’re a cold water person, a wide mouth bottle also makes it easy to add ice to your water. Under Armour Dominate 24 Oz – This is a great bottle that is actually made by Thermos. I love the Locking flip top lid with one hand push button operation and the flip up carrying loop. I also love the silicone grip for a comfortable hold. It’s a bit on the pricey side and too wide for some car cup holders. This is my favorite bottle to bring to the beach as the lid really keeps the sand out and the water stays very cold for hours, even in the hot sun. 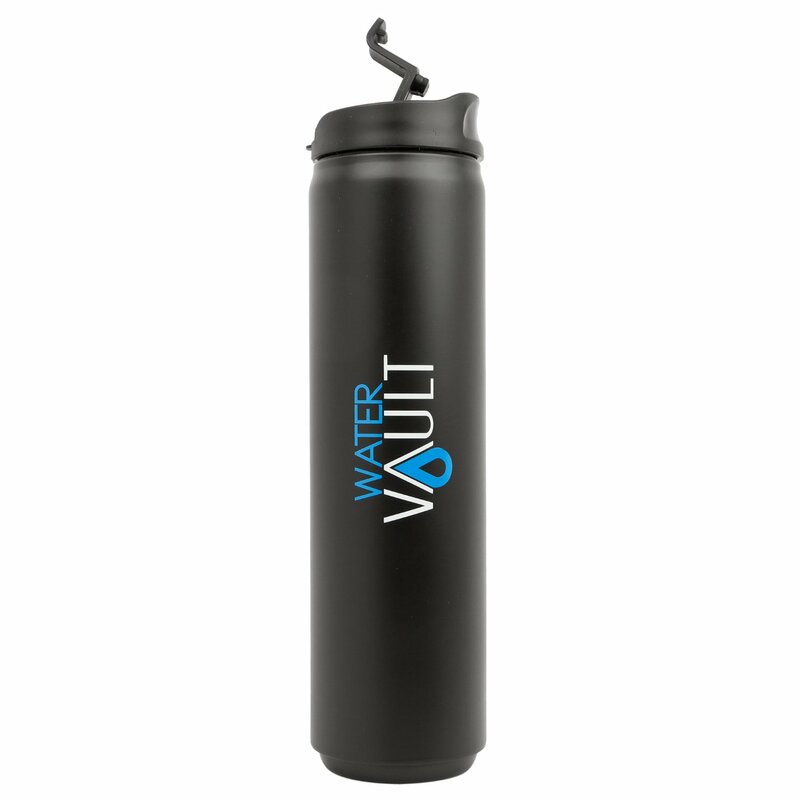 WaterVault Sports Tumbler 20 Oz This is a straight-forward wall vacuum insulated stainless steel bottle at a great price point. I like it’s slender design and protected “sipper” style top. There’s something about the sipper that just works for me — it doesn’t dribble all over my cheeks when I tip it back for a big gulp, it feels more dainty than some of the wide mouth spouts. I like bringing this bottle to yoga class. Fliptop Aquatix 27 Oz This is a really great bottle that meets all of my criteria, except for the fact that it’s a tad big at 27 ounces. The pop up top functions similarly to the Under Armour bottle above and feels very sturdy. I do wish it came in other fun colors – I’ve only found it in boring black. This is my go to bottle for SPIN class, as it’s easy to get a big gulp quickly and I find I need and go through the extra volume it holds. Contigo Autospout 20 Oz This is my go-to gym bottle. I love the convenience and functionality of the pop up silicone spout (yet it’s still very protected and covered when not in use). It’s much easier to drink water at the gym by sucking out of a spout versus tipping — trust me, tipping a bottle on the elliptical may not end well (it certainly didn’t for me). The only down side to this bottle is that it’s much harder to clean the straw and spout than it is to clean any of the drinking areas of the first three above. Thermos Pop of Pink 18 Oz My favorite bottle for throwing in my purse for a day of errands. A great pop up lid with a silicone straw. At 18 oz. this bottle is slightly smaller than my usual but that’s perfect for days, with a lot of walking, when I want to lighten my load. With a the straw spout, it’s still slightly more time consuming to clean but still way easier than my Contigo. 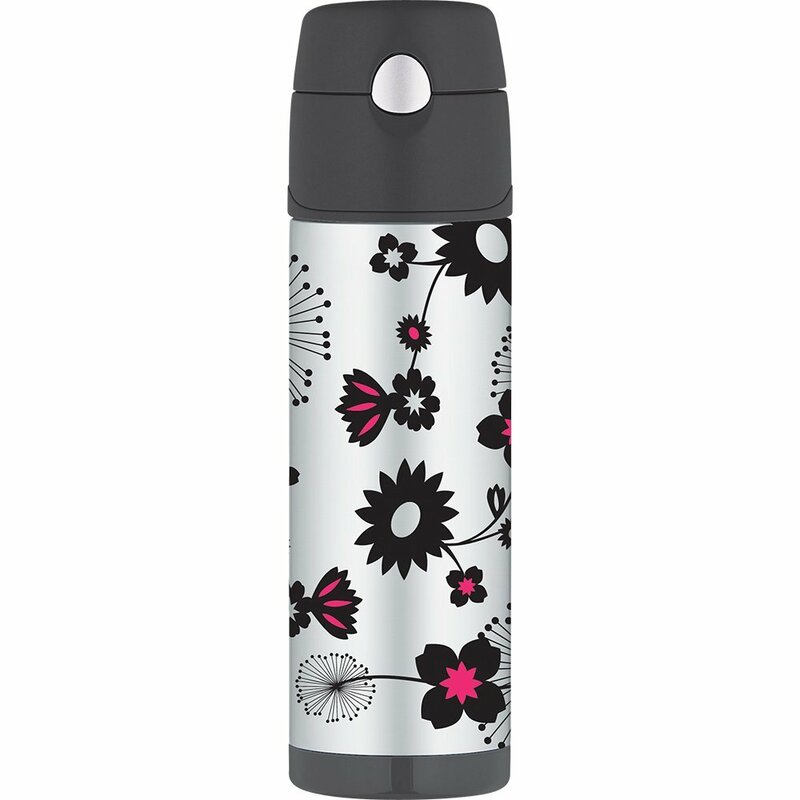 Thermos makes many great designs that are similar to this and also has awesome kid-sized stainless steel bottles. All-in-all they’re my number one brand. 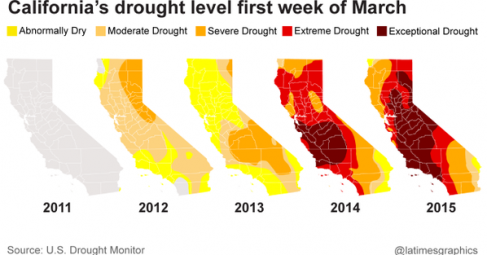 In response to California’s severe drought, Governor Jerry Brown issued an executive order on April 1st calling for a mandatory statewide 25% reduction in urban water use.The California drought situation is on my mind several times a day and has shifted my behavior in countless ways. The phrase “We’re in a drought” gets thrown around countless times each day in our home……”We’re in a drought, don’t leave the water running while you brush your teeth”; “We’re in a drought, please finish the water you asked for”; “We’re in a drought, don’t just dump that water down the sink, use it to water a plant”; “We’re in a drought, the shower isn’t a place to relax”; “We’re in a drought, pick your towel up off the floor it doesn’t need to be washed after one use”. To me and my people, “if it’s yellow, let it mellow” should clearly be the state’s motto (there may be a shortage of water but we haven’t lost our sense of humor). Although I’ve installed high efficiency toilets in my home (as has most of San Francisco), I still don’t flush for “just” pee and my children know to do the same. After all, the average person uses 80-100 gallons of water per day and flushing the toilet takes up the largest amount of this water. I literally don’t pour any water down the drain. Whether it’s water from boiling eggs or a few swigs left in the bottom of a glass, I collect it in a watering can, that I keep next to the kitchen sink, and use the water for my house plants or garden. I felt guilty leaving the water on for 20 seconds to splash and wash my face each night so instead I switched to using a face cloth that I wet for just a few seconds…..and I definitely don’t wait for the water to get hot anymore. And you should see my car, clearly going to the car wash is not an errand that’s been in my rotation for a very long time. My mind is always working and wondering about ways to conserve. When I’m doing the dishes, I ponder if it uses more water to wash the dishes by hand or to load them in the dishwasher. When I’m gardening, I think that I should really put down new mulch in my vegetable bed to help retain moisture. When it rains (which is seldom) I think about how I really need to build a rain barrel to collect the drainage. When my kids spill a container of nuts, I think about how much water it took to grow those nuts and how horrible it is to throw them out. And, I wonder about bigger things too like, what happens to our groundwater and the water that goes down the drain…..if all of San Francisco’s water comes from Hetch Hetchy (read more about San Francisco’s Hetch Hetchy water in my post here), is there a water purification system to recycle the drainage like in other cities (I researched this while writing this post and will cover it soon in another post)? It irks me to no end when I see water being wasted……walking into a public bathroom where the sink is running or driving by a fire hydrant that is gushing water for an unknown reason, or, the one that infuriates me most of all – home and business owners that hose down the sidewalk in front of their property daily. It’s also made me judgmental when I’m a guest at other homes – I get annoyed when people leave the water running at the kitchen faucet, while they’re busy with another task, or bathe their children every night in separate baths. My kids, ages 4 and 6, are also very aware, and taught at school about the water crisis and how to conserve. My oldest keeps a pan under the tub faucet to catch drips after it’s shut off and my youngest tells me that she doesn’t need fresh water in her container that she brings to school everyday and that every other day is just fine. I also see the changes on a city-level. Our beautiful playgrounds with water-play areas stand dry. Restaurants are not allowed to serve patrons water unless it is requested. Medians on streets are no longer part of the city’s watering schedule and often look sad. Parks have put in grass that doesn’t require watering or mowing. City street cleaning happens significantly less frequently. 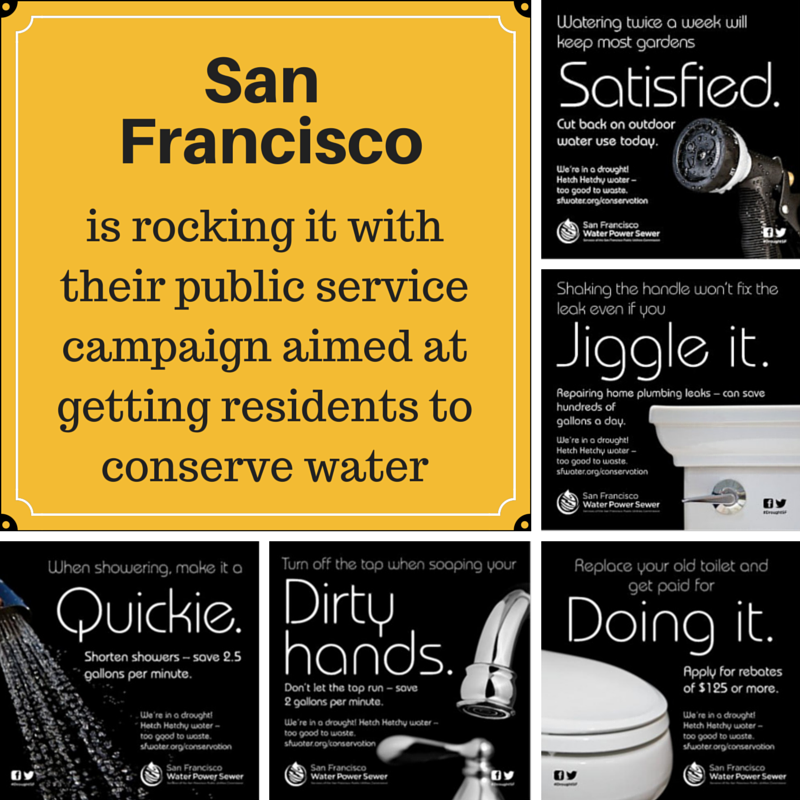 Several water-saving incentive programs are in place, including large rebates for replacing regular flow toilets with efficient flush models, and replacing residential clothes washers with efficient models. 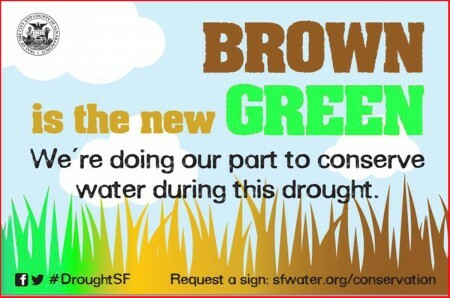 And my personal favorite is the city sponsored signage for residents to display, touting “brown is the new green”. I feel like I’m doing my part to conserve and I’m proud of my kids for what they know and their respect for the earth. The changes we’ve made have now become habit and will be part of us no matter where we live, with or without a drought. And for the most part, I’m impressed with the awareness and actions of the people around me and the city I live in. San Francisco has one of the lowest per capita water usage numbers in the state, averaging less than half the state average for gallons per capita per day. The funny thing is, it’s when I travel outside of California people seem concerned on an entirely different level. The minute I say I’m from California, they say “wow how’s the drought”……”it sounds really scary”…….or, “it seems really bad”………or, “what is California going to do?” It’s strange because these are feelings I don’t have and questions that don’t cross my mind. I don’t feel scared or desolate about the situation, instead, I feel like there’s been a lot of positive small changes around me and with me. Although the drought has impacted my daily behavior in meaningful ways, I don’t actually think about the scale of the drought and how it may impact the future of my family, city and state very often. Maybe it’s because it would depress me and I work hard to see the positives; maybe it’s because I’m too busy with the small changes and I’m choosing to focus on a minuscule part of an issue that’s so much bigger than me, my family or my city — residential water use accounts for only 12 percent of the total water used in the state; maybe it’s because global warming is causing all kinds of shifts and there are opportunities for change everywhere. So I choose to focus on change and setting the best example I can for my children and this next generation. Although I sometimes find myself feeling ignorant to the larger issues when outsiders quiz me, I also know that I truly care, I’m living it every day and the changes I’ve made feel completely OK.
Do You Know How Much Water You Drink in a Lifetime? 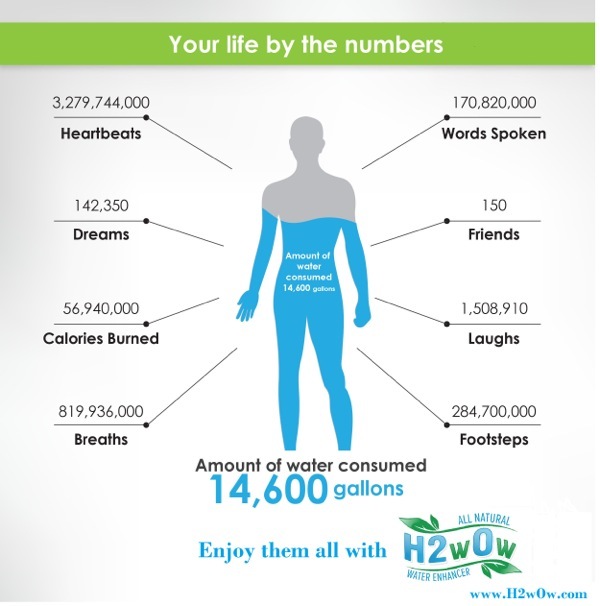 I love fun facts……like how much water the average person drinks in a lifetime. I know it’s a bit dorky but I can’t help myself 🙂 Somehow these random facts tend to stick with me and become ingrained in my head. And, they actually do make a difference in my actions, for example if I knew the total amount of water I would drink in a lifetime, perhaps I would become more cognizant of the quality of the water I was drinking or in how I can help make more of a difference to conserve water in CA, where our drought situation has become alarming. I believe “fun facts” can make an impact……they can surprise people and in turn get them to think about something differently, sometimes even producing microscopic (or greater) shifts in behavior. So, to channel my guilt I decided to come up with a “fun fact” infographic to blog about and get myself back on track with writing regular posts. With my fun facts theme in mind, I went off on a tangent collecting random in-a-lifetime facts that for one reason or another interest me. In addition to learning that the average person consumes 14,600 gallons of water, I learned many other things…….some will stay with me and some I will forget by tomorrow. On a side note, I’m always fascinated by what sticks in my brain and what I easily forget….. I learn a lot about myself by just observing what interests me at a subconscious level. I think the other fact that will stay with me is that the average person has 150 friends. At first this seemed like a very low number……I mean many people have friends in the thousands on social media. But this number really made me stop and think and when you start to count the true friendships in a lifetime that really shape a person 150 sounds on target and, at least for me, indicates that I have more amazing friendships to look forward to. So, in an effort to keep this post very light and to not over think the content too much…..here is the infographic. Hopefully you will find at least one “fun fact” that will move you.